Institutional fit and type will be a topic of conversation throughout your career, and it is especially important to take time to reflect on if you are currently job searching. I remember this time last year feeling overwhelmed deciding between big/small, public/private, liberal arts/research institution, and a long list of other factors. My undergraduate education was completed at a small liberal arts campus with a three-year live-on requirement. My graduate education took place at public institution with over 30,000 students, and I absolutely loved diving into one specific functional area. On the other hand, a small institution would likely allow me to be able to be more of a generalist and work on lots of different projects. This also sounded fun! After much reflection and my experience through The Placement Exchange (TPE), I accepted a job at a small (5,000 plus students) public engineering and social science institution. The School of Mines is a good balance with the small school feel at a specialized public institution. I know everyone who works in student affairs at Mines and can walk across campus and always recognize students. As an undergraduate, I was the opposite of an engineering major: I studied political science and communication. My graduate experience was focused on reading, writing, and a constant journey of self-reflection. I like to say I am wired to think and process information differently than the students at Mines. Though my practice is in many ways the same, I had to adapt and change the way I work with students. My presentation style has improved to meet the needs of the students at Mines. Students here like specific examples, many have told me they don’t really like talking about their feelings, and I learned how to make flow-charts to explain processes. I’m challenged to use the left side of my brain on a daily bases, and in turn I challenge students to use the right side of their brain. I have the focus of working in Residence Life, and in many ways get to be a generalist because of the size of the department. I share a little bit of my story as an example because where you work truly does matter. There will be bumps in the next phase of your journey, but to the best of your ability reflect and seek to find a place fitting for you. Do the mission and values of the institution align with your personal mission and values? Can you be your authentic self every day? Is there a good possibility of finding a mentor? Will you be able to fulfill my purpose with the support of others? Above all, listen to your heart. Lots of folks will have an opinion of where you should end up, but in the end it needs to be your choice. Many of you likely have read Where Your Work Matters. 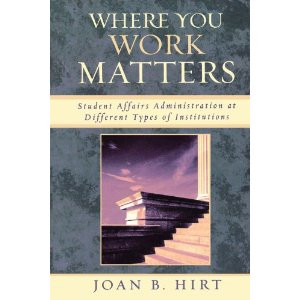 The book shares great insight on student affairs practitioner experiences at different types of institution. It covers everything from nature of the work and work environment to pace and production of work. A great read, especially for anyone job searching!